Shielding gases are used in laser welding mainly for protecting the weldment from contamination during welding and solidification. However, the change in shielding gas composition has shown to alter the properties of the laser welds. In the present work, the effect of shielding gases in CO2 laser welding on metallurgical, hardness and indentation creep properties of P92 material was studied. Experiments were carried out in bead on plate mode using three different shielding gases, viz., Ar, He and Ar + 20% N2. Defect-free welding could be achieved with a wide range of parameters with all the three shielding gases used for experimentation. With respect to bead geometry characteristics, He resulted in good penetration with narrow width followed by Ar + 20% N2 and then Ar. The microstructural analyses indicated that welds had tempered martensitic structure after post-weld heat treatment (PWHT) with no deleterious δ-ferrite phase for a wide range of heat inputs. δ-ferrite phase could be observed at very high heat inputs (> 360 J/mm). The amount of δ-ferrite is dependent on the shielding gas composition. High heat input welds made with Ar + N2 gas mixture had very low δ-ferrite content compared to welds made with He. Hardness values were comparatively higher for welds made with Ar + N2 mixture in both as-welded and PWHT conditions. Indentation creep properties of welds were better than the base material. Among the three shielding gases experimented, welds made with Ar + N2 mixture had superior indentation creep properties followed by welds made with Ar and finally He. The authors are thankful to the management of BHEL for allowing us to carry out the presented work and also for permitting us to publish the same. The authors thankfully acknowledge Dr. G. Padmanabham, Director, ARCI, for permitting us to carry out the trials using the facilities at ARCI and the contributions of Mr. K. V. Phani Prabhakar, Scientist ‘E’ and Mr. E. Anbu Rasu, TO of ARCI in carrying out the laser welding trials. Sincere thanks to Mr. R. Easwaran, GM-IC/WRI and Labs for the continuous support and guidance. 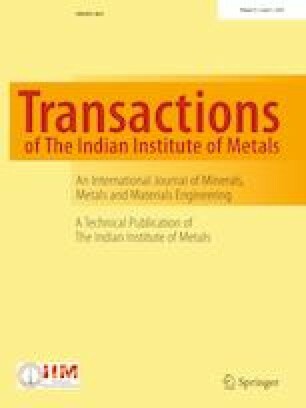 The authors thankfully acknowledge Dr. R. Nagalakshmi, Mr. R. Ravibharath, Mr. Johnson Clawrence and Mr. P. Mouragane of WRI for their support in characterization of weldments.